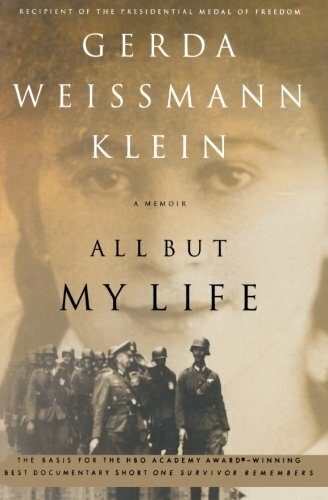 All But My Life is the unforgettable story of Gerda Weissmann Klein’s six-year ordeal as a victim of Nazi cruelty. From her comfortable home in Bielitz (present-day Bielsko) in Poland to her miraculous survival and her liberation by American troops–including the man who was to become her husband–in Volary, Czechoslovakia, in 1945, Gerda takes the reader on a terrifying journey. Gerda’s serene and idyllic childhood is shattered when Nazis march into Poland on September 3, 1939. Although the Weissmanns were permitted to live for a while in the basement of their home, they were eventually separated and sent to German labor camps. Over the next few years Gerda experienced the slow, inexorable stripping away of “all but her life.” By the end of the war she had lost her parents, brother, home, possessions, and community; even the dear friends she made in the labor camps, with whom she had shared so many hardships, were dead. Despite her horrifying experiences, Klein conveys great strength of spirit and faith in humanity. In the darkness of the camps, Gerda and her young friends manage to create a community of friendship and love. Although stripped of the essence of life, they were able to survive the barbarity of their captors. Gerda’s beautifully written story gives an invaluable message to everyone. It introduces them to last century’s terrible history of devastation and prejudice, yet offers them hope that the effects of hatred can be overcome. This book is a very good memoir on a Jewish girl’s experience in Nazi Germany. It talked about many things that are often discussed in World War II books, but Gerda’s perspective adds a different light to the facts. Gerda was not an extraordinary person. She was just trying to survive and we remember her and other people for doing just that.